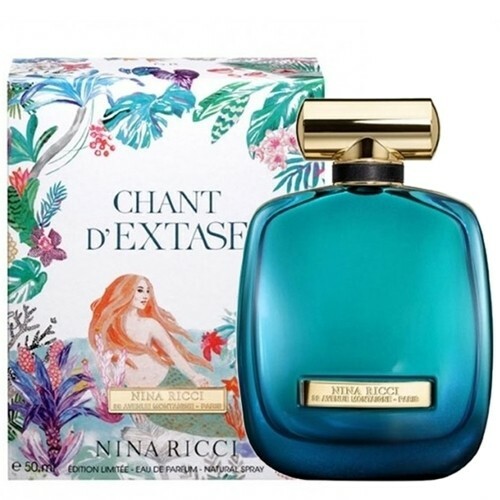 Chant d'Extase comes out in the spring of 2018 as a limited edition interpretation of the original L’Extase fragrance from 2015, one of the main perfume pillars of Nina Ricci, inspired by women’s eroticism and fantasies. Chant d'Extase paints a picture of an imaginary garden lush in vegetation - Paradise de Nina Ricci – and the seductive siren’s song from the legends. All this is depicted on the outer packaging of the fragrance, illustrated by Polish artist Martyna Zoltaszek. The composition represents a sensual scent of raspberry, rose, jasmine and caramel.